After reading the great feedback about the Alternis Kerbol mod and working within the vanilla/OPM solar system for a few years I was excited to try the new solar system out. 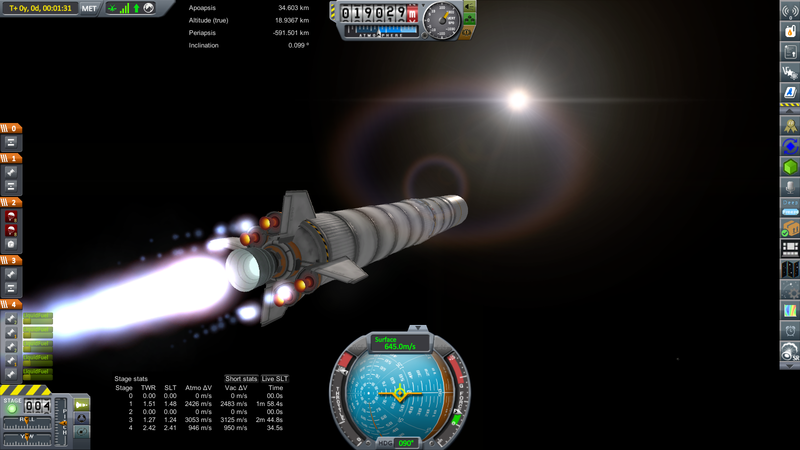 I am still working in KSP 1.2.1 because it takes a long time in RL to get anything done. I was not sure if the latest download of the mod would incorporate into the old version of the game. After making a copy of the KSP 1.2.1 folder I copied in mod files and tried to start the game up. It did start ok, upon inspection Duna is missing completely. I’m unsure whether I’ll be able to copy it in from another version but for now I thought might be interesting to take the Kerbals from my previous save who were just launching their first Kerballed Duna mission after working towards it for 7 years (career mode) and ‘start again’ in the new system. Once I get the story going I’ll post in Mission Reports. After 7 years the Kerbal’s in the Trekking Career Mode save launched their Duna Transfer Vessel “Percival Lowell”. In the prior years, the KSC with the assistance from long time supporter DDRocketsInc had used robotic spacecraft to investigate much of the Kerbol system all the way out to Sarnus. They had orbital science stations circling Kerbin, the Mun and Minmus, and since they completed development of all rocket parts on the technical tree several years ago, the science that the orbital laboratories provided was turned quickly into funds by the administration team. There were probes and communication relays deep in the inner system, in orbit around beautiful green Jool and even one in hibernation on it’s way to Plock. So, when Jebediah the director of the space programme and veteran of 15 kerballed flights, 7 more than any other Kerbal called them all back to headquarters to announce the crew for the first Kerballed Duna mission there was much excitement. The senior science team T’Pal, Janeway and Hadfield Kerman wanted to get to the ‘red planet’ to see how different it was to the Mun but, looked at each other suspiciously – it had become clear in the latest communications that due to the length of the trek, Fregard Kerman the director of the Science Division wanted to send some younger scientists like Pheomma or Valphe Kerman. Everyone in the auditorium could tell that the engineering team saw this get together as a significant distraction to their ‘real work’. Comments from SRide Kerman such as “it’s all easy for you scientists waiting for the DTV to arrive to start work, where the ones who have to make sure it makes it all the way there” echoed from yesterday as the engineers spent more time looking at their computer screens than the presentation “First Footsteps on Duna” that Jeb was scrolling through. As usual the Pilots looked “Uber relaxed”, senior pilots Paris and Legerchel Kerman who had been working in the simulator with the back up team pilots, Riker and MReynolds Kerman idly thumbed their data screens looking at the results from yesterday. “What the?” Paris looked at Mayweather, finally not moving along the ground. “Is everyone ok?” asked Janeway as she moved from one of her team mates to another. “You’re not going to believe this!” called Hadfield to anyone within ear shot as he opened the door to the auditorium and looked outside, “what the hell is that?”. As more Kerbals met at the doorway they looked up on an unfamiliar sky. 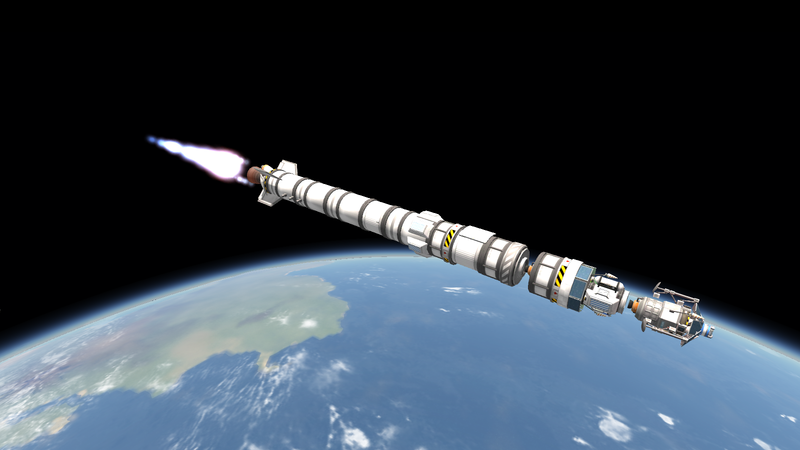 It looked as through Kerbin had moved in it’s orbit. Above them was a grey/orange gas giant. Kerbol, their mighty star reflected dimly off it’s delicate hues. “Quickly, science team please get to the Tracking Station we need to find out what is happening” Jeb called. 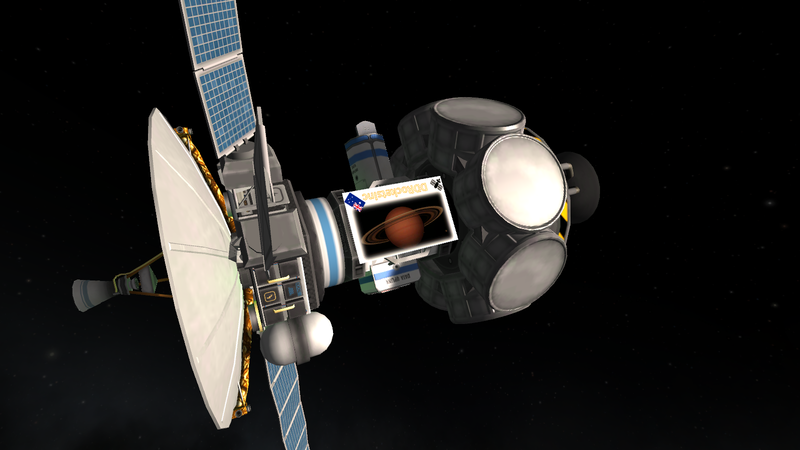 The Kerbals bolted to the Tracking Station. Looking at the large display they could not believe what they could see. Kerbin, their beloved planet was now an unrecognisable moon of this blue gas giant. 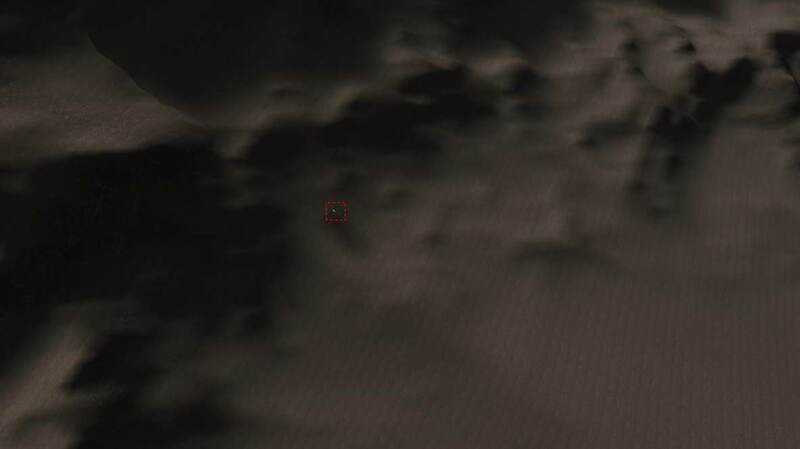 The computers in TS still tracked is as “Jool”. 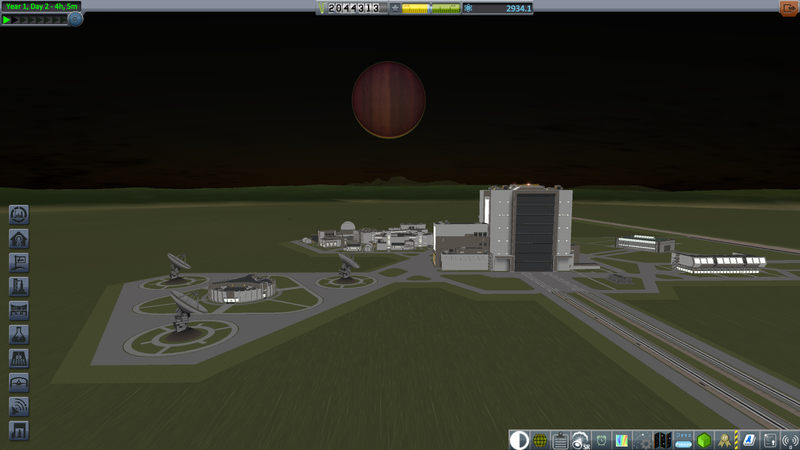 Beyond almost every Mun and planet in the Kerbol solar system had been shifted, and Duna had completely disappeared. The computers were tracking no orbital science laboratories, no probes, no communication relays, nothing. The “Percival Lowell” and her flotilla of robotic support landers were nowhere to be seen. Made Chapter 1 a spoiler so first post is clean. Hehehe, wait til the Kerbals see how Kerbin's (and everything else's) geography and often even size has changed as well I'm sure you'l have a lot of fun in Alternis Kerbol. I'm enjoying it myself. I assume you really know what happened to Duna and are just pretending the Kerbals in the story don't yet know. When I installed the mod there was no Duna, I am not sure why but it could be because I am still using KSP1.2.1 or that the mod competes with OPM. I need to do some more investigating to understand what happened. “Ok, ok”, Janeway Kerman slowly, thoughtfully. Sigming, Seanely and Asign who had walked outside as soon as the orbital traces were on the screen, bowled back through the door. “Everyone please listen” panted Asign. “We have been up to the top of the VAB, the” she stopped, tears in her eyes, Sigming, the only colonist to fly so far, continued “the orbits are the only change, normally from the VAB on a clear day you can see something of the Island Runway and the structures we built there – the lights at least, but now,…..nothing”. “That’s not all” Seanely had been moving closer to the control desk and bought up the CCV camera controls. “Look at the warehouse in the basement of the VAB”. 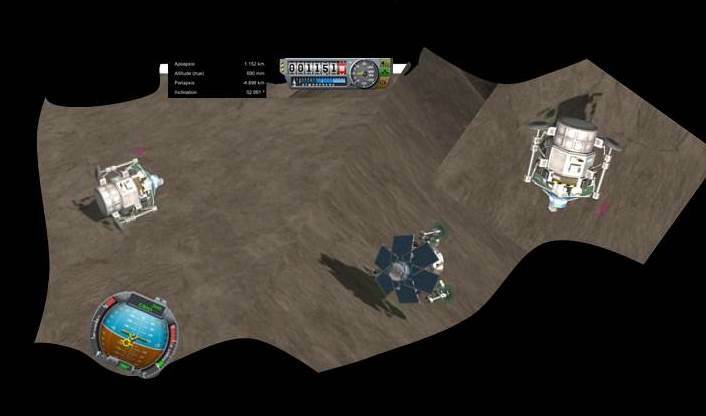 As he moved the camera feeds onto the large main screen, the Kerbals looked at each other in disbelief. Where up to only a few minutes ago the warehouse had been full of rocket parts all the way up to the mighty 3.5m parts, all the Kerbals could see were a few 1.25m parts, some basic science parts and probe bodies. As he swung the camera around, Bill, Director of Engineering yelled “Stop”, “Jeb, look, even the 3D printing equipment and robotic construction equipment is missing. It is like the Tech Tree was never finished”. 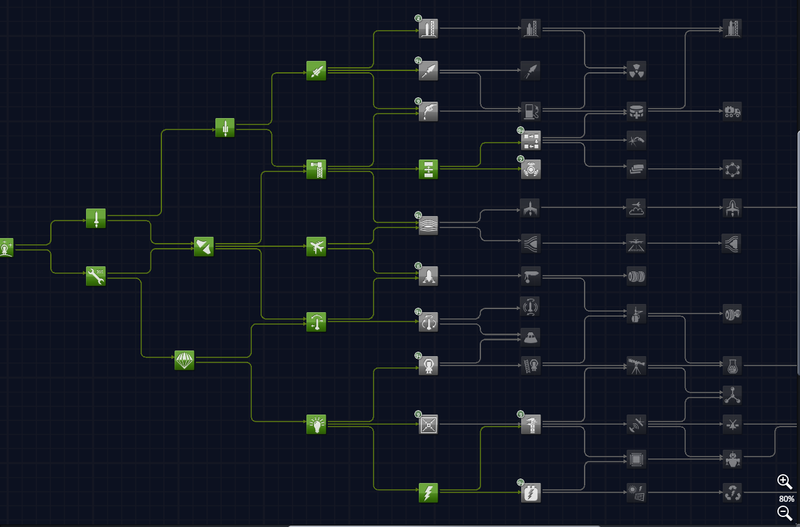 Bill moved to the controls and pulled up the R&D system, sure enough when he selected the Tech Tree, only 4 levels were complete with 2 nodes on the 5th level researched. Jeb moved around the room, his hands moving like he was flying the 1st Minmus shuttle to orbit, mimicking the stick movements. “Fredgard, take Janeway, Hadfield and the other scientists to the R&D building, let’s work out if this is an instrument failure or if we have a real problem.” Another step, “Bill, take as many Engineers and Colonists you need, I want a full inventory of that warehouse, to solve these problems we are going to need to put some rockets up”. Fredgard, Bill and the majority of the Engineers, Colonists and Scientists moved away, out the main Tracking Station door and into the afternoon light. The Pilots wondered what Valentina, director of pilot corps and Jeb were planning for them. HSolo, a pilot with more stories from the local drinking establishments than flights said “I’ll help Paris”. “Us, um, three, we can help” said Colonists Sigming, Suenna, Heruki “Just tell us what to do”. “Good” Jeb called, walking towards the doors “Make it so”. “Valentina, how did Paris and the other’s do?” Jeb asked, sitting down with a cup of hot coffee. It was well after sundown now he needed all the help he could get to stay alert. ”and 2.6 million funds I see” Bill pointed out. “steady Bill, we can’t go building parts willy nilly” Fredgard held up his hand. “Anything else” Jeb asked Fredgard. “well, more good news I think, though it is confusing.” Fredgard moved to the next slide. “Well, should at least keep the scientists happy!” Jeb exclaimed, Fredgard had a way off look that Jeb knew meant he would not get anything else helpful out of him today. Bill, an old school engineer, handed out pieces of paper with very detailed drawings on them of each part currently available to the Kerbals. “Within the fuel tanks are some live support modules. How effective they are I can’t say. Many of the upgrades that we worked on with DDRocketsInc and @Roverdude of Umbra Space Industries have disappeared.” Bill was pointing to the paper in front of him. 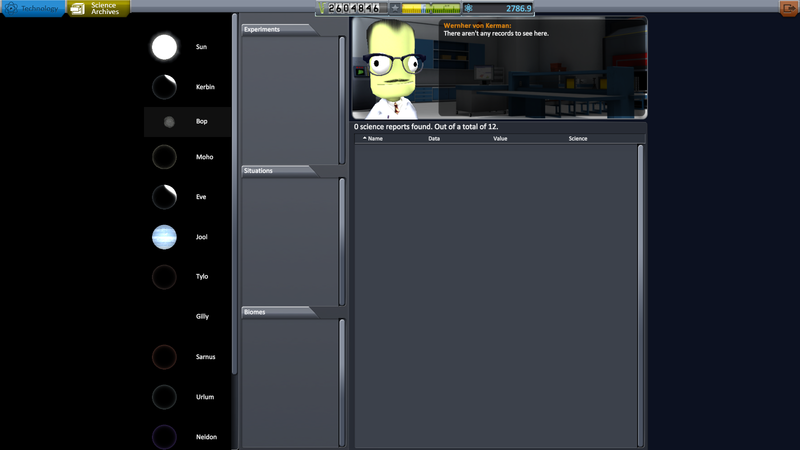 The assembled Kerbals looked at him, then their paper, then at each other. Thankfully, SRide Kerman, who came to the meeting with Bill, secretly predicting this would happen. She started up the holographic generator and transferred the slides up to it. Jeb, Fredgard, Valentina all relaxed. Fred gave her a thumbs up. 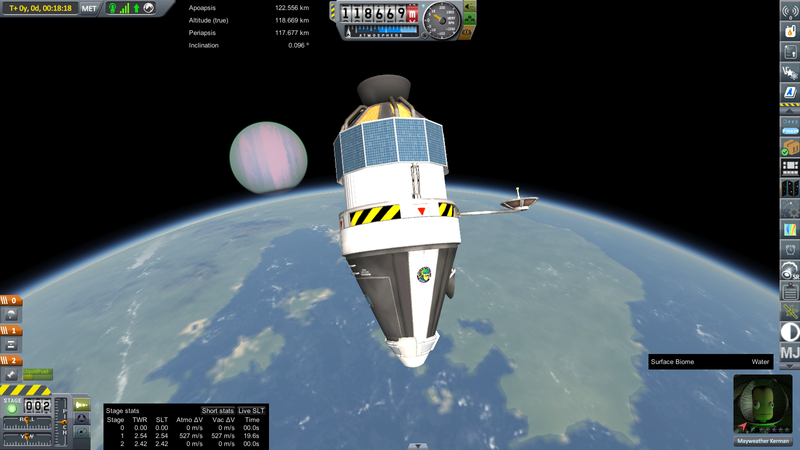 PV in orbit of Kerbin in the original solar system, habitat expanded while ship was undergoing in orbit tests. PV Engines connected, just prior to the crew arriving. “Thank you all for your time. Please pass on my thanks to your teams. Go back to your families, rest and tell them that we are working to try and find out what has happened.” Jeb sipped his coffee, now 3 hours into the meeting wishing is was something with a little more kick. “How did that go sir?” Valentina asked. “Not well, I think communication will be priority number 1, but I have to think first. Please go home, be with your families and we will reconvene at lunchtime tomorrow for some supplies”. In the next Chapter we will see how the Kerbals adapt to the new Solar system. 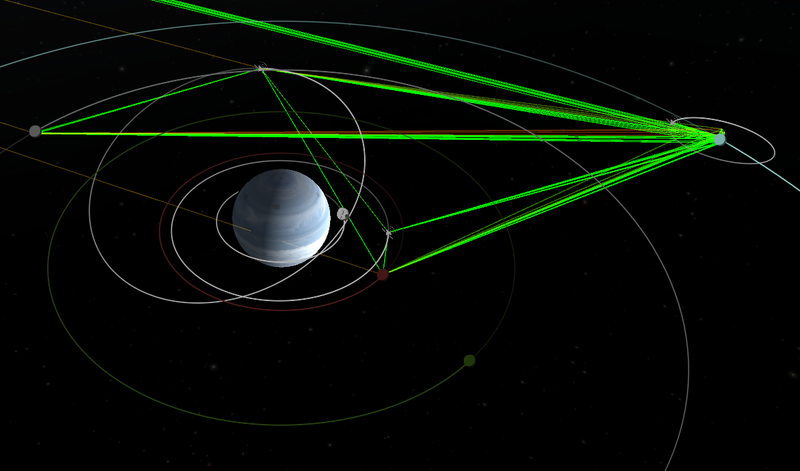 OK, in Alternis Kerbol, Duna and Dres are both moons of Tylo, which itself has been promoted to a major planet (4x Kerbin's gravity and a bit of atmosphere) in the next orbit out from Jool. So did you just not know where to look for Duna, or is not orbiting Tylo as it should be? Strange. I have no idea. Have you tried re-downoading and re-installing AK? “Contract Accepted” the Mission Control computer’s automated voice stated. 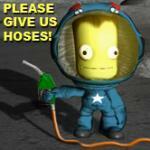 The Kerbal Space Centre’s management team read through the paperwork again. “What about the solar panel efficiency problem?” Billy-Bobrey asked. “Should we get some communication relays up first?” Jebediah asked. And there is launch of the first probe in this new solar system, Bop Pioneer, on the new, tiny, Intrepid Alpha 1.25m launcher.” The launch communicator’s monotone voice filtered out throughout the KSC. 2 minutes 15 seconds later, Bop Pioneer, was above Kerbin about to circularise a 120km parking orbit on it’s way to Bop. Billy-Bobrey shook his head and walked off. “so, what’s the fix?” Valentina enquired. “Didn’t think I was listening did ya?” Kim smiled, it was not a hard hit, just a little fun. “How long? We are on a time line for this contract” Bowman enquired. “What about the solar panel efficiency?” SRide was looking through the stack of pages. “Better than we thought, we think this series of Chimera relays will last for 4 to 5 years. Hopefully all those scientists will get something done soon and we can unload the next level of panels. We have already included the repairs into the production system.” Kim found the pages as he spoke to prove the point. “Give me a look? You’re says we have 2 relays over Kerbin, the scanner made it to Bop and then you sent another to act as a Relay there too?” Paris was looking through the launch pictures. Bop Pioneer 'Bop Basher' just prior to impact. 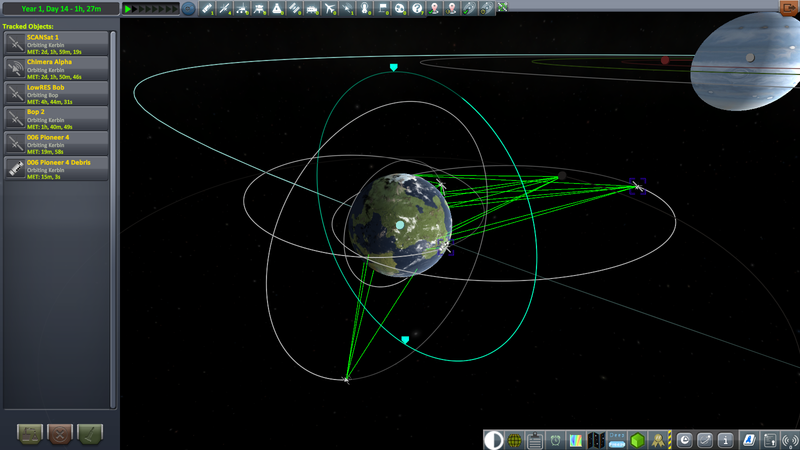 Communication Network started, Orbit of Bop achieved. For the Engineers in research and development the next few days were quiet. With the Pioneer Class Probe, Chimera Class Relay Satellite and Intrepid Alpha 1.25 recoverable booster proving their reliability, for the launch team and Mission Control it was anything but quiet. Loud to the point of bleeding ears would be more like it. Jebediah spent most of his waking hours with Gene Kerman in Mission Control. Together they looked through contracts that would both net some funds, get some Scanning satellites up to work out the topography of Kerbin and also allow the Kerbals to get much needed communications network up and running. Another few days later, Jebediah was thumbing through more contracts when a young scientist, Phoemma and young engineer, Tasha wondered in. The two of them waited until Jebediah acknowledged them. Gene handed her a piece of paper that she remembered he and Jebediah were both looking at when she and Tasha walked in. She read it, it was a contract to land on Bop. “No sir” the women answered in unison. Tasha and Phoemma held the contract together and felt quite lightheaded. “What will Valentina and Fredgard say?” Phoemma asked as they left, “I don’t have to think of what Bill will say, but I know he will be yelling it at me!” Tasha whispered almost to herself. “It’s your baby ladies, you should be very proud.” Paris Kerman clasped his hands together with relief. Tasha and Phoemma stood, stunned as the images came through from Bop SCAN Sat in orbit of Bop to confirm what the telemetry had showed, Bop 2 had landed on Bop with 77DV left. The pilots were getting restless. Programming flight data into probe cores and monitoring them from the Tracking Station was not what they were “built for” as Paris put it. So when Lagerchel Kerman came past and said that the KSC management thought there was sufficient funds in the budget to attempt the 1st Kerballed flight in the Alternis system without a contract to pay for it. Most nearly fell over each other to get into the action. There was no budget for test flights using automated/remote pilots and none of the pilots wanted to do that anyway so Lagerchel put all pilot’s names into an aerodynamic cowling, shook them up and asked Jebediah to pull out a name. “Me sir, I am a new pilot out of training, I was hoping for my first flight when the solar system busted” Mayweather said breathlessly as he ran up to the front of the group. “now my first flight will be our first flight” he added full of enthusiasm. “Do you really think it’s a good idea? Surely a more experienced pilot would be better, we know very little about the atmosphere here and how a new capsule will handle.” Jebediah asked Lagerchel as he thumbed the blueprints of ‘Gagarin’, the new orbital class capsule that Bill had bought in. “I mean, Mayweather might be keen but keenness will not help if all hell breaks loose up there”. 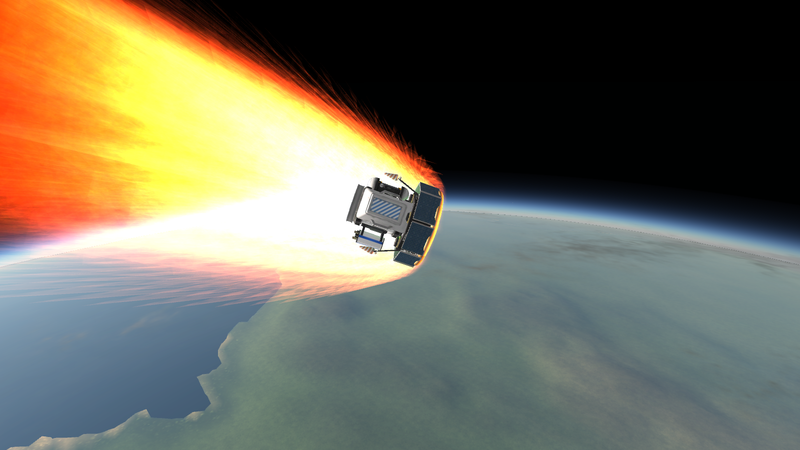 The KSC Engineering team looked had been looking forward to the Kerbal’s returning to space. 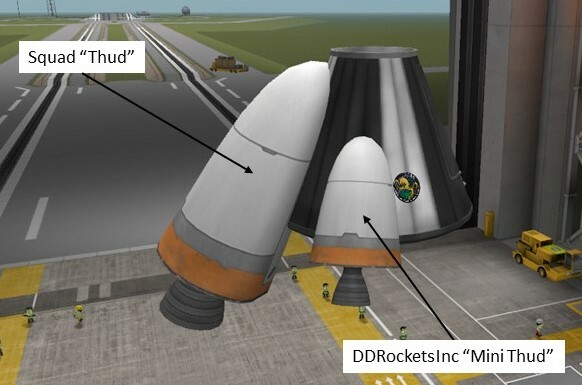 One of the main drivers for using parachutes to recover the first stage boosters on all of the probe launches was to create a pool of funds to develop the “new” first Kerbal approved booster. So sitting around the engineering table they took Bill’s Sketch of the “new” Kerbal capsule and added to it a sketched of the new Kerbal booster. The meeting took a whole day. They risk assessed power generation options, life support requirements, rocket engine possibilities (there were not many available in the warehouse) always relating to the development completed before the Alternis (the name they had given to the new solar system) destroyed so much of their history. 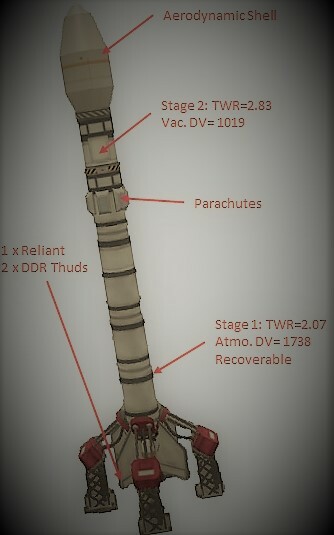 They deliberated over DV for each stage, possibility of recovering the second stage and even how many science modules to be added to the capsule. After the meeting Bill, along with T’Pol Kerman took the results to the operations team of Jeb, Valentina and Fredgard. Bill was confident that what the engineers had come up with would be approved. He was surprised when Valentina completely rejected the addition of the science instruments. 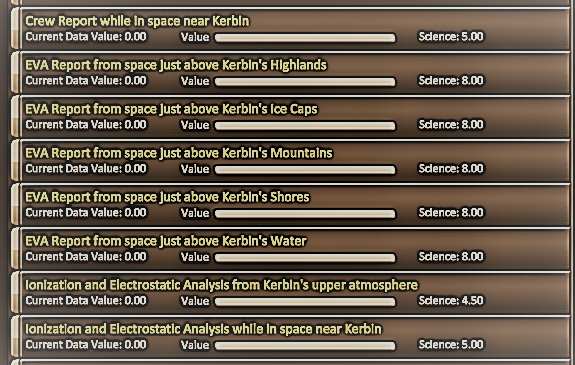 So most of the science units were removed. They left the electronic charge experiment onboard to allow for internal testing of the service stage, the weight of the capsule fell by several ton and gave the booster a break as well. The day arrived. Mayweather Kerman could not hide his excitement. With a strange colouring of Gas Giant Jool, Mayweather strapped in, looking more pensive. The countdown began…..
“Launch, Mayweather Kerman becomes the first Kerman to enter space……………this time………in the Alternis systems…………yea, right……….” The launch announcer seemed equally excited and confused as he wondered what to say. “Mayweather, this is Capcom, your away and in the boost phase. How does it feel” Capcom asked over the communication channels. “…..eessdfer……rewffg……It feels smooth, how are you reading me…..over?…rtregfvfdv.. fv"” the speakers within Mission Control boomed. “Wow, that is rough, can you clean that up?” Jeb covered his ears, that was rough man! “Working on it, sorry” Bowman Kerman, the pilot on Capcom said as twiddling the dials to clean up the transmission, we have all seen that the DV to orbit is different here, are we really confused that the atmospheric interference is different? The Intrepid Alpha 1.25 booster, on her 5th flight performed flawlessly. The first stage burnt out on time and was recovered on the parachutes to the recovery barge on time. The 2nd stage lit and then relit to push the Gagarin capsule and Mayweather Kerman into a 100 x 100km orbit perfectly on the equator. “yea, baby!” Mayweather screamed over the com channel as the capsule engine shut down and his instruments showed he was in orbit. “ouch, I am glad you cleaned that com link up Bowman!” SRide said as all Kerbals in the room covered their ears to protect them. “Do you really mean for me to apologise?” Bowman looked embarrassed. “Weeeeeeee……………..eeeee…………….eeee, I’m upside down now!!! Jool looks odd through this telescope, it is a different colour up here.” Mayweather barely stopped screaming. Several orbits later, the scientists had a crew report, 5 EVA reports and 2 Ionisation & electrostatic reports to keep them happy. Considering the capsule was confirmed in an equatorial orbit the fact that Mayweather managed to get an EVA report over the Ice Caps was very confusing indeed! Paris replaced Bowman at Capcom and talked Mayweather through the deorbit burn and re-entry process. His capsule was recovered from a smooth splashdown. Jeb and the others wondered how they might mark the occasion. Surely a party was called for! Congrats on Mayweather's historic flight! Is his middle name "Floyd" or "Money" ? But what mod are you using that changes the color of distance Jool? I've got EVE and it looks blue whether on the ground or in space. 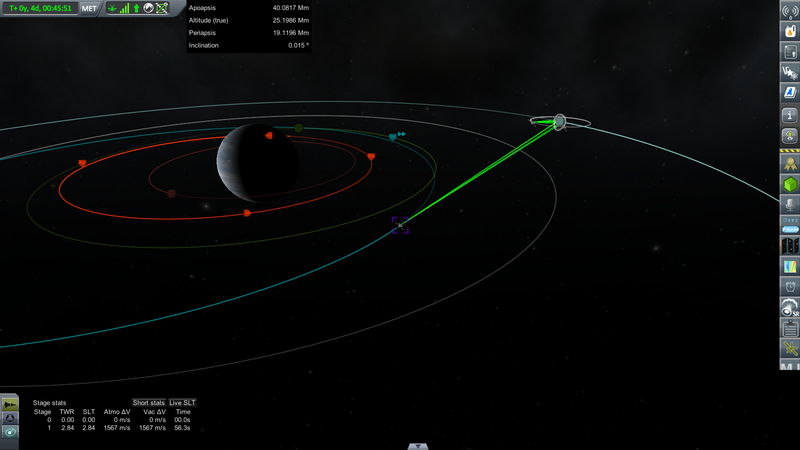 FWIW, Kerbin is tide-locked to Jool so it takes a wee bit more dV to reach orbit than in stock. The atmosphere and gravity are the same as far as I can tell. Regarding the colour of Jool from a distance, I am not sure what is going on. For visual enhancements I'm running EVE and distance object, when I first loaded the Alternis mod the clouds on Jool on the main menu screen were green rather than the retextured blue colour therefore I removed some of the cloud config files for Jool. that sorted the main menu but left the screenshots with a red Jool. I'm going to keep trying to work it out for the moment in Trekking through Alternis I guess the Kerbals don't know any better so live with it!! 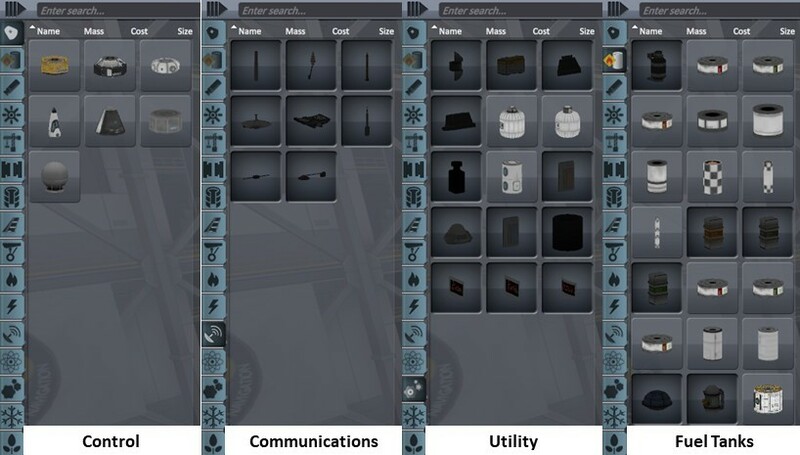 @GregroxMun has made his own EVE configs for the AK system. It's a WIP but it's still quite nice. The number and appearance of the clouds on various planets fit logically and give each a unique feel. Here's the link to the EVE configs. I don't recommend scatterer yet but there are also some of those. EDIT: Duna's missing almost certainly because you're in 1.2.1. Remove the config file Gamedata/AlternisKerbolRekerjiggered/TemporaryFix.cfg. That should fix Duna. The excitement that was generated by Mayweather’s flight was extreme amongst the pilot corps. The KSC had 3.8 million funds available but there was a lot of science and exploration to be done, so Jeb, Wernher and Gene did not want to spend too much of the reserves on developing and flying Kerbal rated ships without contract’s to pay for them. So together most of the pilots exploded into Mission Control and grabbed exploration contracts for experiments around Kerbin, Bop, and Jool, 9 in all. Then they run over to engineering warehouse to ask the engineers for robotic satellite and boosters to fulfil the contracts. Paris was first through the door, followed closely by over excited Mayweather. The first engineer they saw was new graduate Scotty Kerman. They grabbed him and went over to a large table where more experienced (each with 4 flights) Billy–Bobrey and Kim Kerman stood looking at the drawings of the Gagarin capsule. “Guys, guys, we need help” Paris shouted – far too loudly – as he threw the contracts on the table. As a group they looked up “what with?” Kim enquired. “we need to make as many funds as possible as fast as possible” Mayweather said “then I can go back into space!” “not before I do, young one” retorted Paris. By now the remaining pilots and many engineers had gathered around the table and were all interested in what was going on. The engineers and pilots went through the contracts, trying to work out how to divide them up. They first collected all of the high fund ones together thinking they could do them first and leave the rest, then 1 of the engineer’s suggested they could leave some for pilots to do when they had funds but it did not seem like the contracts aligned well. Then they put them together in terms of destination, it seems logical until an engineer pointed out they could probably get the Bop contract fulfilled while getting a gravity assist enroute to Jool. Nothing seemed to line up. Eventually 2 scientists, Katia and Dilmund pulled over a whiteboard, without asking for a contract they wrote on the board “Contract Stacking”, then Katia added on the left side of the board “Kerbin, probe core, heat shield,” and Dilmund added on the right “Jool, probe core, antenna, magnetic sensor” “ if you want to make funds we need to build as few probes as possible with that each satisfy as many contracts as possible” pretty soon the engineers worked it out and bought contracts up 1 by 1 so there requirements could be added to the board. 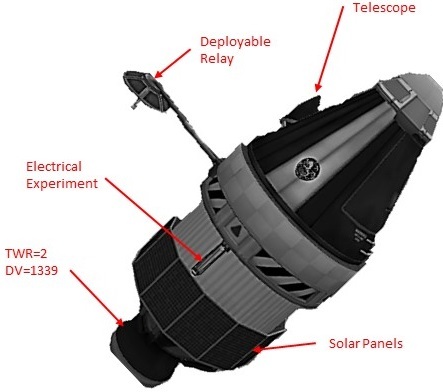 At 1 stage Scotty had a thought of brilliance that if they made the Jool probes have detachable science/experiment modules then as long as the main bus had sufficient batteries and a relay dish rather than return to home communication, it could remain in orbit to act as long term communication relay. Several hours later the white board contained outline for 5 ships to complete the 9 contracts. “If only we had larger boosters like before” queried young engineer Valphe, we could boost several into orbit together. 1.25 m heat shield test. With the outline of the probes complete the engineers along with staff from DDRocketsInc started on configuring a booster to take the 1st package aloft. 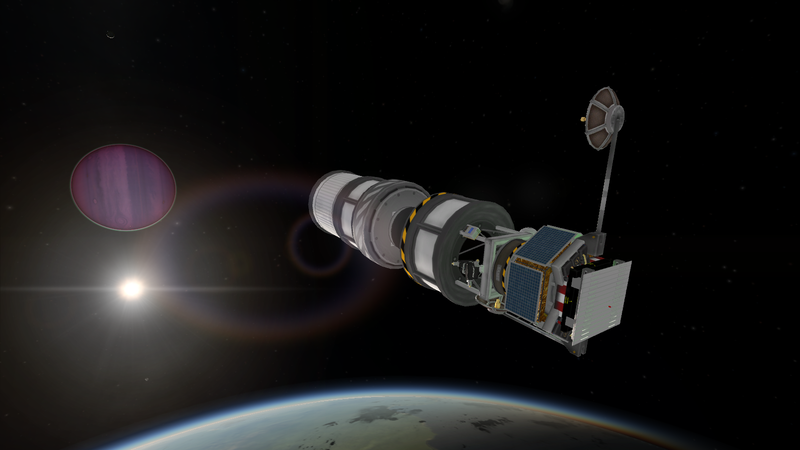 They selected the Kerbin return probe with the heatshield as the starting point. With an all up weight of XXT with manoeuvring stage (a terrier because it is the smallest available) it was clear that Intrepid Alpha 1.25 booster was not going to cut it. Taking the Alpha core booster and 2nd stage they walked about the warehouse looking for power options. “Moar Boosters” called Kim. 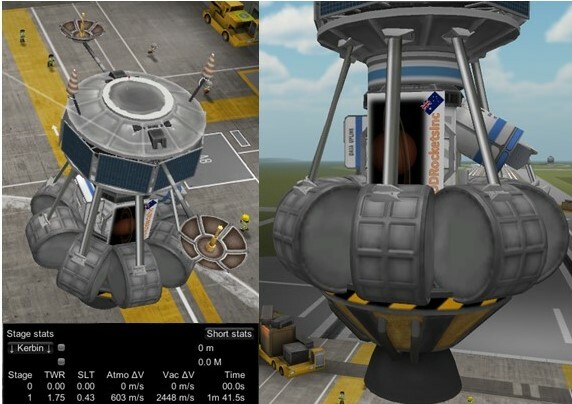 While the probe engineers worked with a 10 Kerbal strong science team to work out how to wire the recoverable hard drive through a decoupler to be able to retrieve the science experiments, Kim, Bill, Valphe and Align all worked the maths and slide rule calculations to work out how to recover the core stage and solid rocket boosters – they had to save as many funds as possible. So came the bright happy day when recoverable probe Pioneer X was mated to the new booster Intrepid Beta 1.25_SRB. 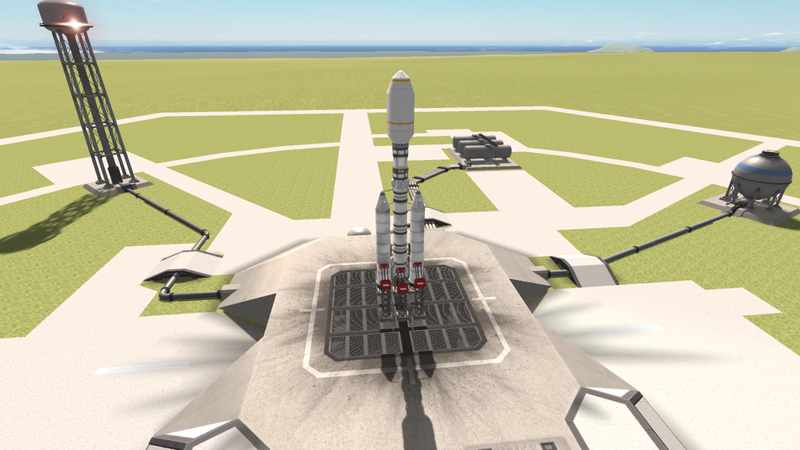 The first flight of the new booster could not have been better. Without separation engines to push the side boosters away from the core stage the engineers were concerned that they would be destroyed in the main engine exhaust. They were not and drifted down on the parachutes beautifully. 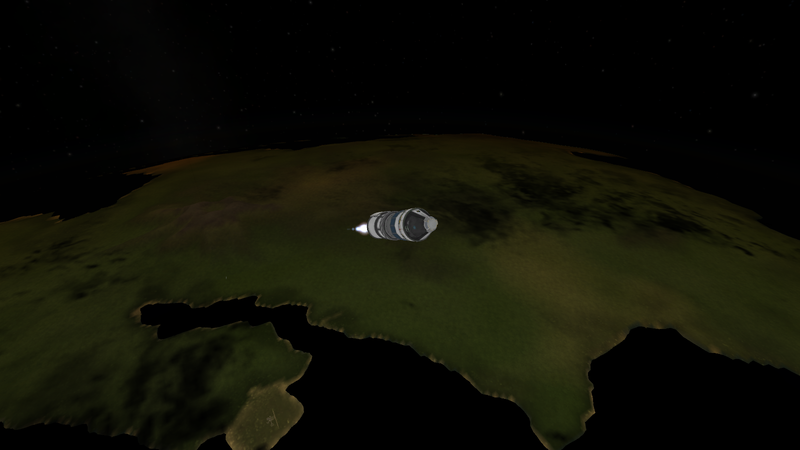 The core stage was also recovered after delivering the Kerbin research probe into a polar orbit. It wasn’t until it was in orbit that the team realised that the contract for long term Kerbin survey orbit required an orbit inclination of greater than 22° so 90° polar inclination meets the requirements! After reaching the polar orbit, the recoverable science module was disconnected from the main section that will become a relay satellite and descended into it’s eccentric orbit to remain in place for 60 days fulfilling the contract requirements. 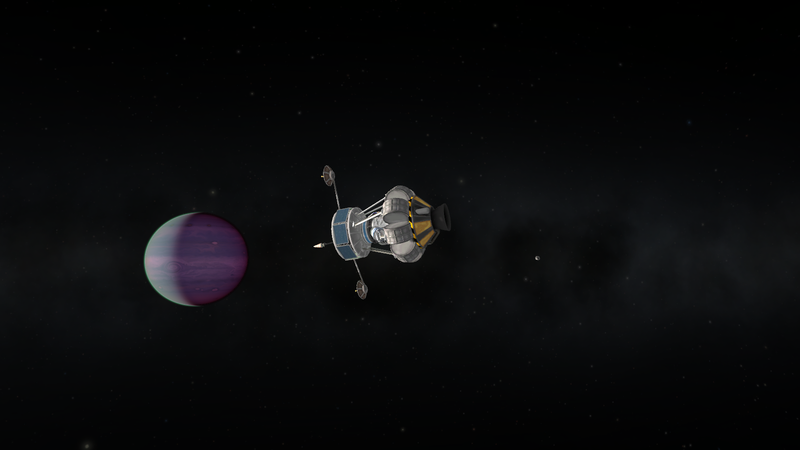 The next test for the engineering team was to design a probe that would reach an orbit close to Jool. 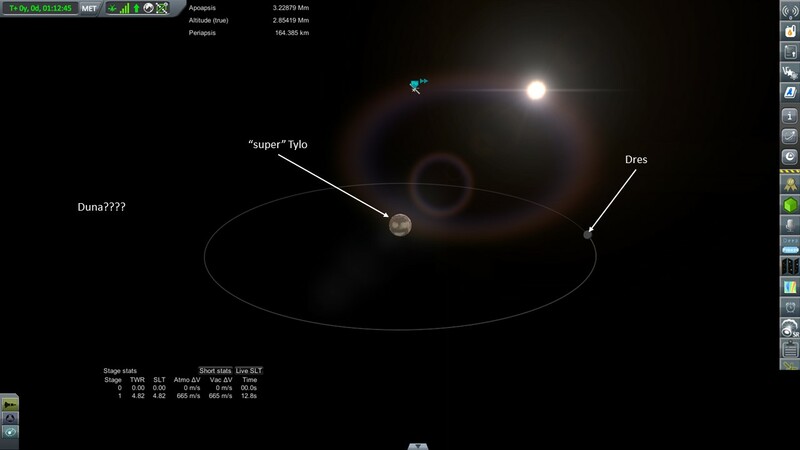 The Kerbals had observed in the tracking station that along with Kerbin a planet that looked like Laythe and 2 other moons, 1 that looked like the Mun were all in orbit of the mighty gas giant. The thought was even if they did not reach the required orbit in the contract getting something “out there” would bring back helpful science and be a great Trekking adventure. The engineers decided to design a probe with as much DV as possible available to it after the new booster placed it into parking orbit. They visited the R&D building and searched through the Technology Tree with the scientists for helpful parts that would replace the 1.25m fuel tanks and terrier engine (in particular) to get parts that were helpful for small light ‘interplanetary’ probes. With the scientists they worked out an affordable path through the tree to get 0.625m ‘Oscar-B’ fuel tanks, and the good old ‘spark’ engine to replace the heavier terrier that they had relied on thus far. In previous launches in the Alternis system the 2nd stage of the Interpid Booster had stayed with the payload long into the flight, for Bop flights it had completed the transfers. The engineers knew that to push the new explorer, dubbed “Wanderer I“ by Billy-Bobrey within the title block of the blueprint before he even started the design, all stages if the Intrepid Beta 1.25_SRB would be required. In line with the Contract Stacking philosophy the new ‘Wanderer’ has an upper core section that will remain in orbit as a relay. The larger secondary section houses scientific experiments and propulsion. The scientific team lobbied that since the engineers could not guarantee how far the fuel would take the probe, better leave the science with the propulsion and use it all up getting data even if the primary contract can’t be fulfilled. For the same reason they requested the engineers include the hard drive so experiment data could be stored for later transmission or retrieval. 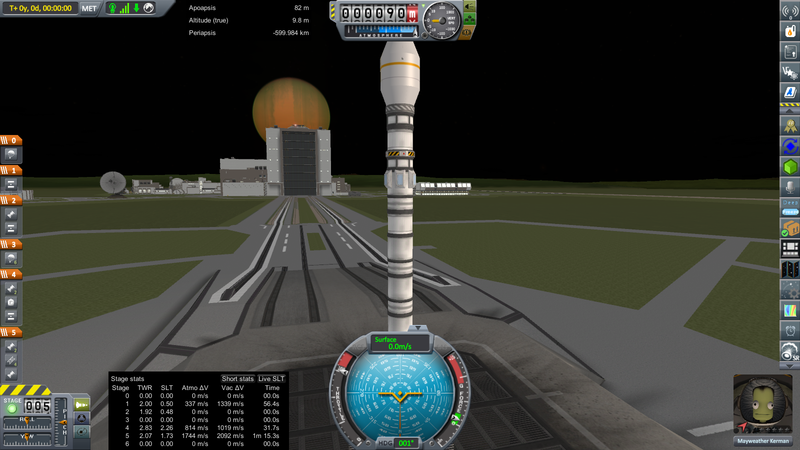 Even with the terrier the main computer in the VAB confirmed an impressive 2,448 DV for the Kerbal’s first probe to venture outside the Kerbin – Bop system. All were in agreement that they should see how it goes. “and no need for an interplanetary transfer window to wait for, may as well just see how it goes” Kim suggested. Hadfield, scientist and orbital mechanics wonder looked at his student Paris, “Mr Kim, if one wants to be precise then one must always wait for the window. We will need to do so, for instance if we want to go to Laythe, even in this system were you can see it from Kerbin.” “I know” Moaned Kim, “I just want to try this baby”. Just as Kim had hoped, Jebediah approved launching Wanderer I the next morning. Reasoning with the others that they can put it into a 100km parking orbit, check systems and then plan the transfer based on real time data. Everyone in the KSC, now excited like Kim. 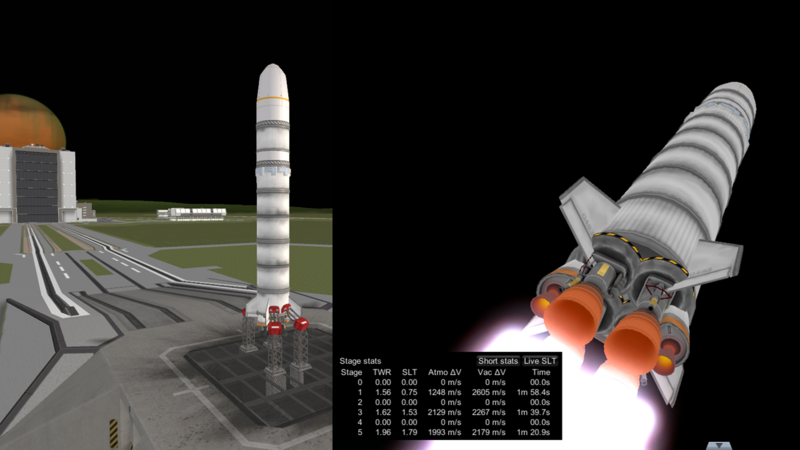 The launch went well, the booster performing without fault. Unfortunately the plan to use boosters and 2 core stages of the booster to reach orbit fell short by ~400 m/s DV, as this was effectively an experimental launch for the Kerbal to see if they can orbit Jool nobody was too concerned. 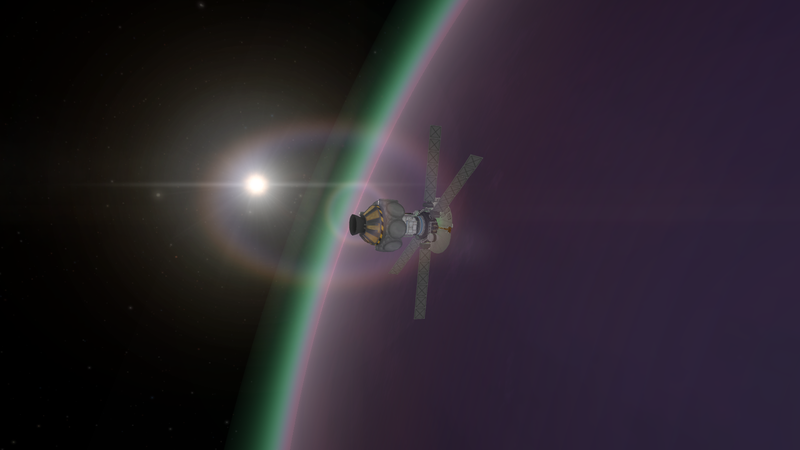 Since the Kerbals still had 50 odd days before they needed to look at the polar satellite again, they did not wait too long to boost the orbit outside the Kerbin SOI. 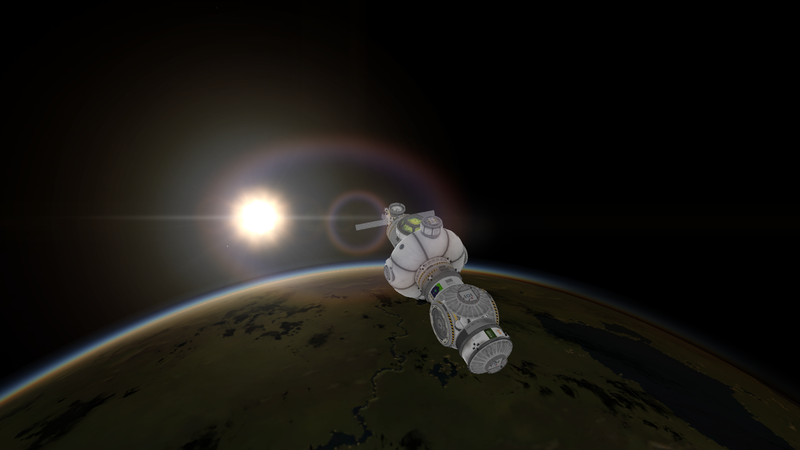 Wanderer I became the first Alternis Kerbal probe to do so. 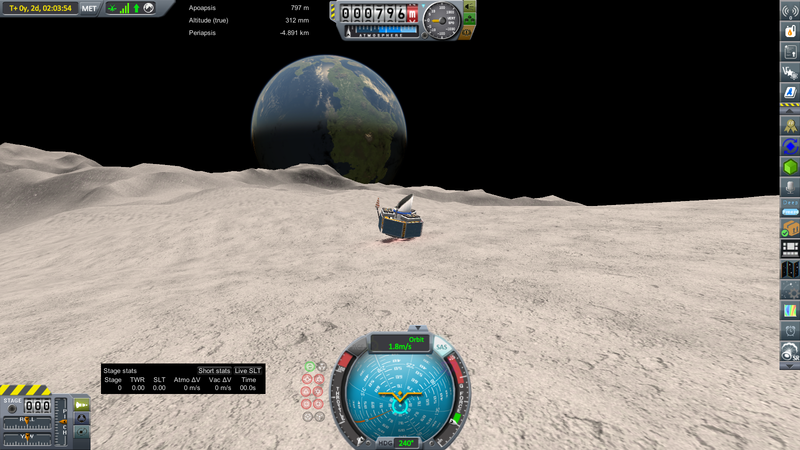 DDRocketsInc is so proud that their equipment could be used by the Kerbals in such a historic mission. 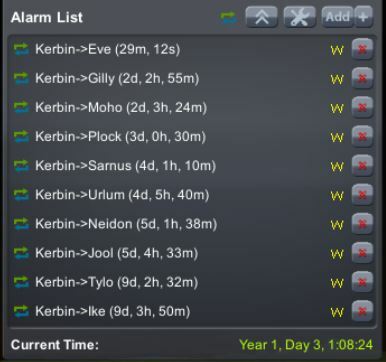 As the tracking data was received showing that the Wanderer I had escaped Kerbin SOI, every Kerbal in the Tracking Station cheered --- every Kerbal except Hadfield and Paris. “No need to check the transfer window, eh, Kim?” said Hadfield over the din as he pulled the data from the printer. Jeb, the whole management team and most of the other Kerbals could not hold back a snigger that ended up a true, Kerbal, belly laugh. Hadfield did not look impressed. Next chapter watch the Kerbals as they land a "proper" lander "with legs" on Bop, bring back a science package for Kerbin orbit and then realise that there is a contract in Mission Control to do the same thing from the orbit of Bop! And yes, mayweather was born on a J class freighter, top speed of warp 2 I think. T'pol, you mentioned earlier, was the science officer. Now you need bernam kerman, because of star trek discovery! RL has been getting in the way of Alternis Treks, but hopefully you will enjoy Chapter 7. While the Kerbals were trying to work out how to get satellite into retrograde orbit, the engineering team focused on the next contract, one that had been missing from the whiteboard because Katia had felt it could not be mixed with any of the others. The contract was to land on Bop. Ever since Tasha and Phoemma Kerman come up with the idea to crash land into Bop, the engineering team knew the landing parameters that had to be met, so they designed a small landing probe with legs(!) to try and make a more controlled landing on the tiny satellite of Kerbin. Together with the science collected the new seismometer and other instruments that would provide data from the surface and pulled together a new design for the lander. 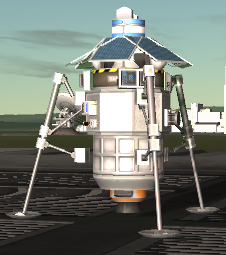 Bop “II” Lander --- now with legs! Soon after the engineer’s at KSC had completed the lander a contract came through to bring science back from Bop. So, the scientists Dunburry and Seanley teamed up with engineer Kim to renew the Kerbin science return probe (Pioneer X) with new parachutes, heat shield and renewed science experiments. Jebediah was so happy with head of engineers Bill’s work on recovering stages that he suggested trying to reuse some of the previously flown hardware. The earlier flight of the Pioneer X had also proven that the Intrepid Beta 1.25_SRB booster had more than sufficient DV to get to Bop, so the science orbiter and the lander were stacked on top of a recycled Intrepid Beta 1.25 core stage, with a new upper stage (so far no upper stages had been recovered from orbit) and 2 recycled solid rocket boosters within only a few days. The booster lit up the night sky over Kerbin and streaked into a 100km x 100km parking orbit allowing telemetry to be verified and Mission Control to confirm that both space ships were operating correctly. 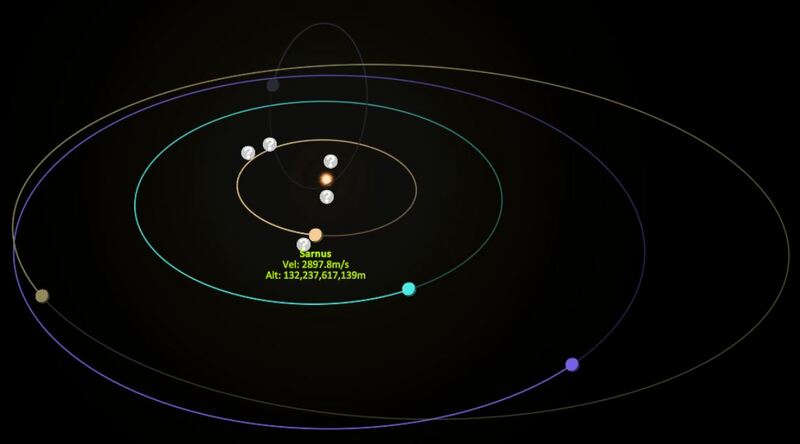 Within a few hours, the Bop science Venturer had established orbit of tiny Bop and the Bop “II” lander disconnected. Dunburry Kerman, a scientist with no flights to his name but an insatiable love for space since childhood had secretly attached a camera to the orbiter. 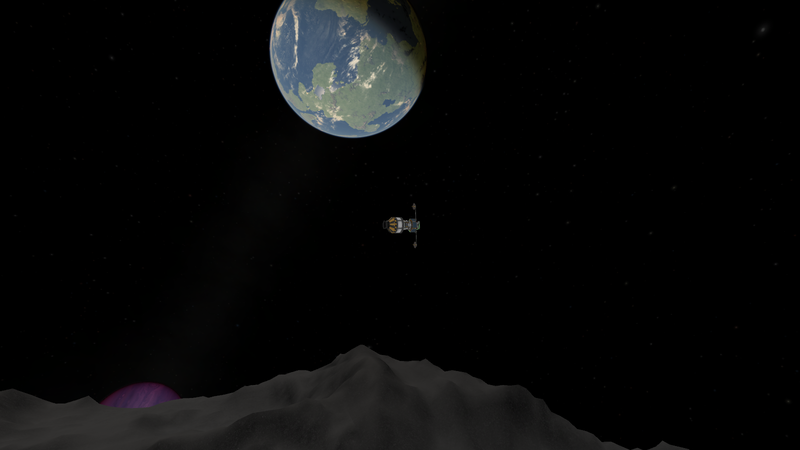 So, rather than the usual telescopic images from the Tracking Station, the Kerbals were able to see a fantastic image of Kerbin, Jool and Bop with the lander preparing to decent to the surface. 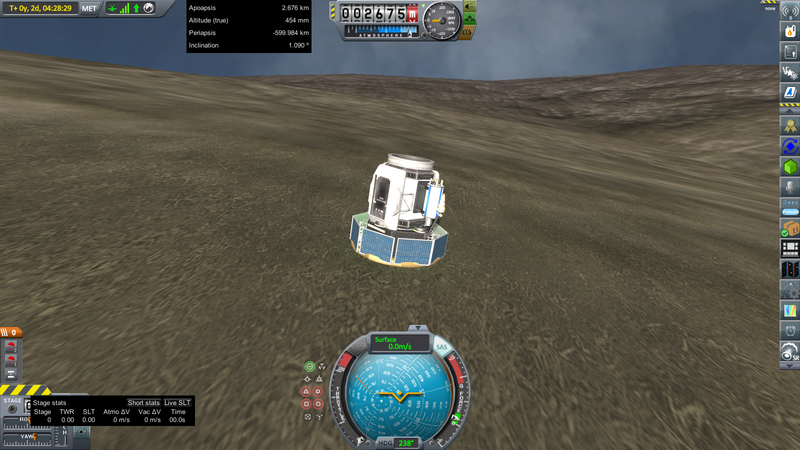 The Kerbal’s confidence was sky high, not only had the mission reached Bop but now it looked like the lander was actually going to make it to the surface. The rocket fired several times, thrust and duration based around the last “crash” landing into the small satellite. Everything seemed to be moving along perfectly. The legs extended ready for a soft landing – and the orbiter was even able to take another photo of the lander on it’s next orbit, though the quality was not quite as good from the longer distance. “lost contact with the lander, sir” Bowman Kerman, the remote pilot flying the mission called out to flight director Legerchel. “Communications, did we lose a relay link?” Legerchel called to communications director Kathbel – her first time in the seat. “Is the orbiter still functioning?” He added, just as he got to the Mission Control door. “Yes, green across the board” Bowman responded. “Ok, Legerchel, how about we see if we can get the imager working better and snap a photo on the next pass?” Kim had now stopped at the door, and seemed to have forgotten about the coffee. “Me too, I’ll get that imager working” Dunburry started scrolling through the orbiter’s telemetry readouts looking for the reason the last shots were so grainy. By the next orbit of the orbiter, Kim had managed to buy coffee for all the Kerbals in Mission Control and Dunburry said he got the imager connected to the telescope to take some better photos. He patched the feed into the main screen and they all looked up. Initially the screen showed the black and white lines typical when the imager was not operating, then, slowly an image of Bop appeared on the large screen. “Look, there, looks like the telescope has focused in on something ½ way down that hill.” Kathbel pointed at a red box on the screen. “Long story, I’ll fill you in soon” replied Kim. “Focus in on it” Kathbel turned to Dunburry trying to get him to focus himself. “All right, let’s see” he pointed the mouse at the receptacle and commanded the telescope to zoom in. The screen changed as the imager collected a series of more focused shots. “Ok, so let’s get this puppy home” Paris said, sitting down at the controls. “ok, then, like I said let’s get this puppy home” Paris already had the return trajectory in the computer and was lighting the main engine. The return run was uneventful. The recycled probe with it’s new heat shield and parachutes worked perfectly and the probe made a perfect landing in a very surprised farmer Kerbal’s field. Despite their recent activities being "hit and miss" the Kerbals of KSC were really gaining confidence. When the management team went back to look for more contracts, there were multiple contracts for long term surveys of Jool's 'moons'. “Oh, yes, they will do nicely” Bill pulled out his sketch pad. Ouch! So, did you hit a misplaced terrain collider during descent? The leading theory among professionals of the Kerbal Astronomical Society is that Bop is mAdE oF dEsPaIR aNd AgOnY. @Geschosskopf Yes, as you suspected, Bop is hard to land on! Well, apart from the minefield of misplaced colliders..... it's not that bad. 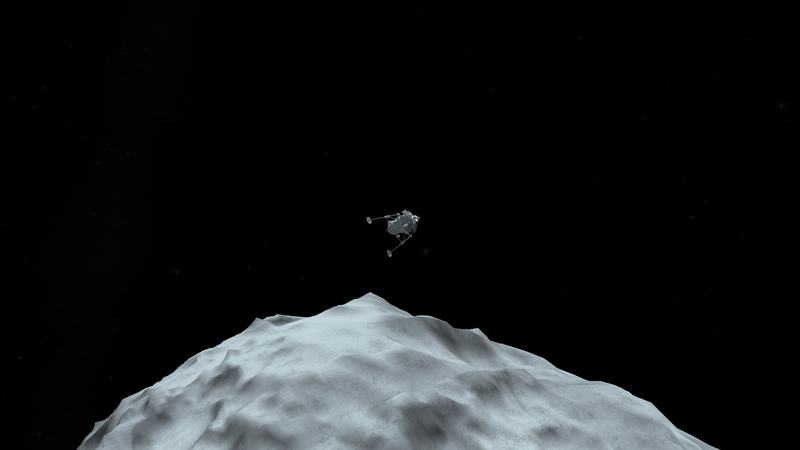 100m/s from orbit to surface and back to orbit, yet it's not so painfully slo-mo as landing on Gilly. So when you do get through the minefield, it's OK. 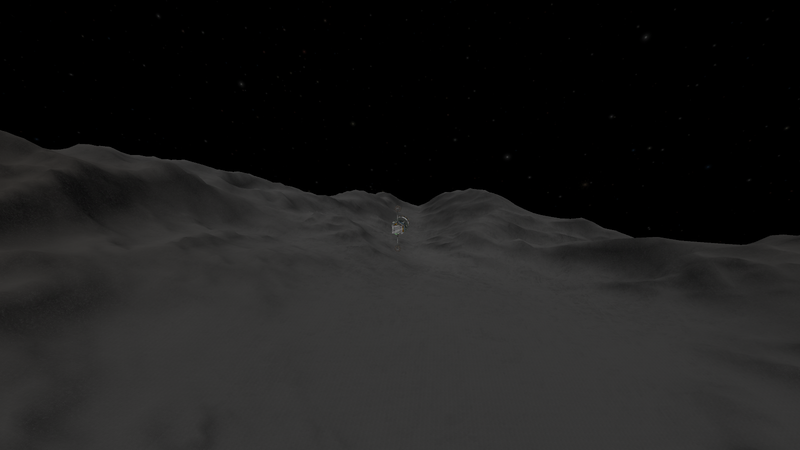 But I'm only batting .500 on that and 0-for-1 on crewed landings) so I decided there are better places to visit. “I’m sorry, but even with 2.5m parts we can’t even think of stacking contracts when we have no idea the DV requirements to play among the moons of Jool.” Bill was fielding questions from the scientists of KSC, he and Fredgard had selected a couple of nice contracts for long term surveys (90 to 120 days in length) round Kerbin and Jool. Their logic was these would provide When he work up the next morning, the scientist had also accepted contracts for science missions to the Mun and Minmus. “But what about gravity assists?” one of the junior scientists, Halcal asked, in our orbital mechanics class we learnt they can save fuel. “They can, but in the old solar system it took us all years to work out the values, now you just want to, what? Estimate?” Tasha started backing up her boss, Bill. “Alright, that’s enough, with the advances we received we can probably launch the first mission towards Jool and gather data for the other missions. How is the design of the new probe coming Bill? 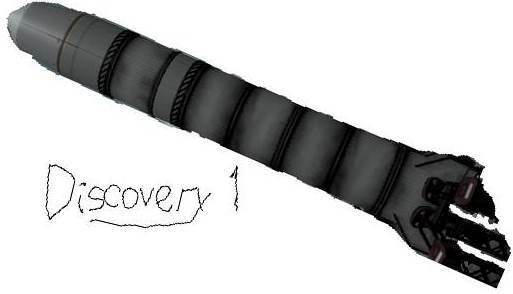 What did you call it, Discovery?” Jebediah, sitting at the head of the conference table broke in. He had a spreadsheet open on this palmtop with the figures for all missions in it. “Um, if you want!” Jeb shook his head thinking of the number of times he was stuck in a capsule with Bill, watching him reading historic texts. He thought to himself he should not really be surprised at this. “Humph, You’ll keep old man” Bill was already out the door. “The Hook is streaming skywards.” The KSC announcer said over the station intercom. 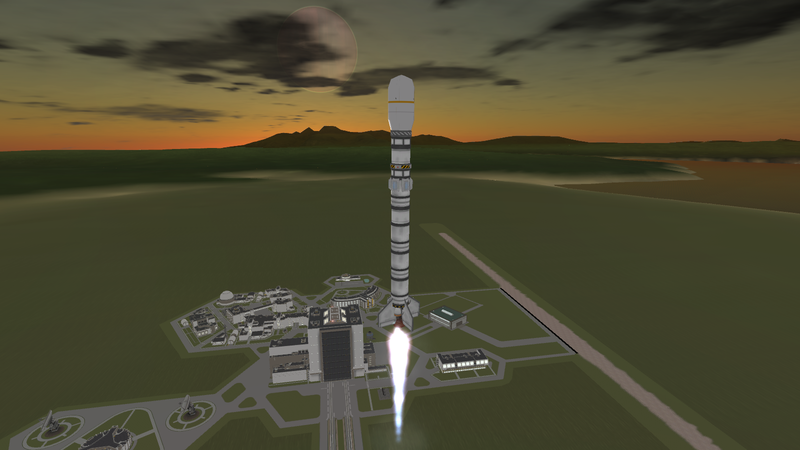 “It’s Hokule‘a!” Bill yelled from the back of the Control Room where almost all of the Kerbal engineers had gathered to see the first of the new 2.5m boosters lift off. “This is the Series 1, it has 4 Reliant engines for main thrust and 2 thuds for steering” Kim was describing to the assembled scientists, who were more interested to see if the engineer’s new toy did not self-destruct and take their brand new probe with it. “We were waiting for some 2.5m engines but could not build them in time” Kim continued. “Can I call it the Prom?” Bill sneered just loud enough for Kim to hear. “or, Theo?” Kim turned from green to red. Maybe Bill will give him that broom after all…. Much to the delight of all the assembled Kerbals, the first Prometheus climbed straight and true, the core stage coming down harder than expected “More parachutes next time I think” murmured several engineer. With the new expandable solar panels and large dish antenna the Hokule‘a I certainly looked different to the other science probes that the Kerbals had built so far in Alternis. 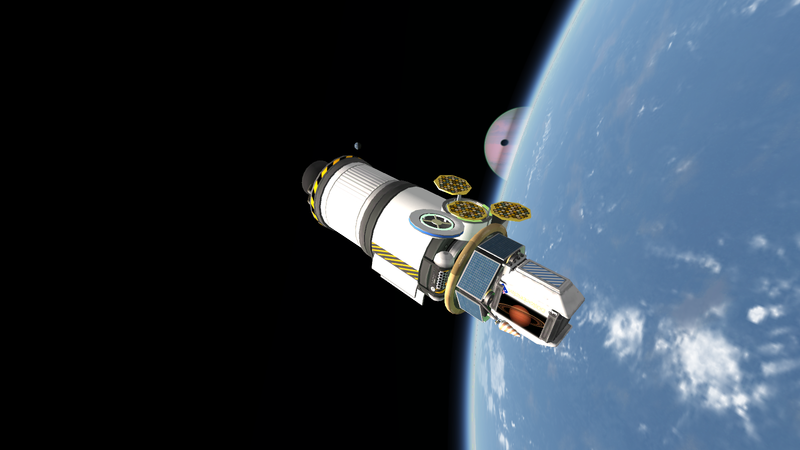 This first model had science experiments for reading temperature, magnetic fields and radio signals required by the first of the long term Jool science contracts. The hope was by moving into orbit around Jool data could also be gathered about fuel requirements for transfers to the Moons of Jool. Hokule‘a I boosted out of Kerbin’s SOI approximately 5 hours later to great cheers in Mission Control Room. 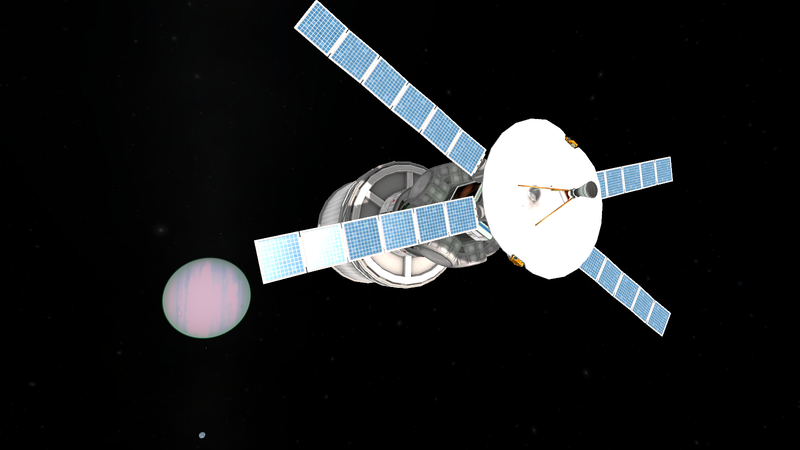 The probe then transferred from a circular orbit of the gas giant into a highly elliptical orbit of Jool over the next few days lowering the periapsis in 4 burns of the transfer stage before that was released. “Wow, we had more than enough DV in the transfer stage didn’t we?” Bill said proudly. The orbital telescopes capturing the probe against a wonderful sunset showing the many colours of Jool’s think clouds through the atmosphere. The elliptical orbit allowed science to be collected “near” Jool and “high above” Jool, keeping all of the scientists busy and happy. The first flight of the Prometheus A-2.5 and Hokule‘a was hailed a great success for the KSC. The management team, Jeb in particular considered that first flight as no more than a proof of concept, he was sure that one of the elements --- the 2.5m booster, aero shell, communications dish or of them together. For it to work so well was fantastic. The KSC had great confidence, over the next several months they launched Hokule‘a series probes to orbit Jool, the Mun and Minmus. Each probe achieved orbit around the target body. As most were sent as part of long term science contracts two versions of the probe were built, one without a science junior and the other with. The science collected was impressive. 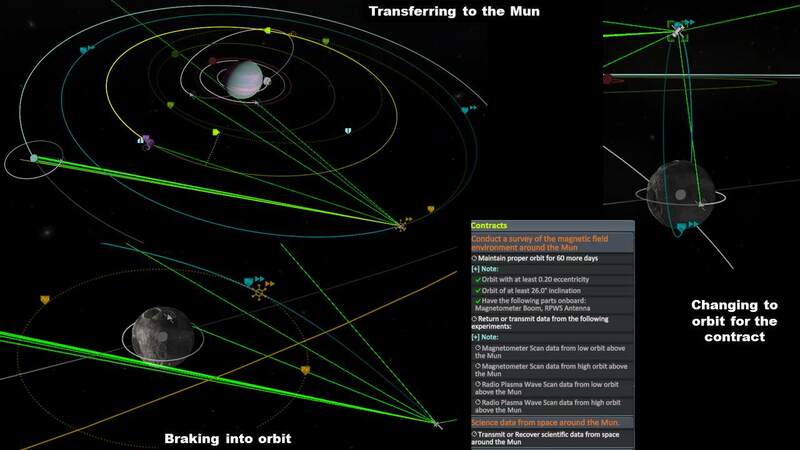 The first Hokule‘a series probe sent to the Mun did not have very much science experiments on board, it’s main task was to act as a relay when Kerbin was on the opposite side of Jool. It did that effectively. When the Kerbals received another contract for a long term survey of the Mun, Goddard Kerman who was given the lead of the Jool Moon exploration by Fredgard the head of science department, approached Bill and SRide about probe weights. “Will that allow me to add a science junior to the Mun exploration mission?” Goddard asked. “Should do Goddard, best way to see is to test it right?” Valphe smiled. 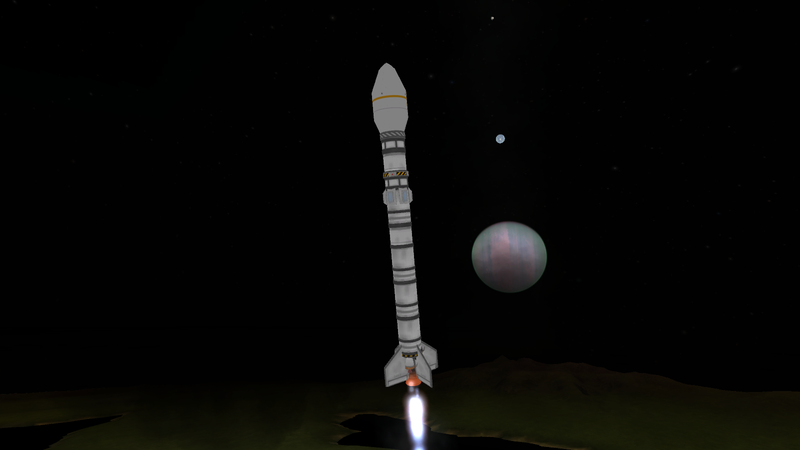 The Prometheus B-2.5 launches for the Mun with revised Hokule‘a series II. 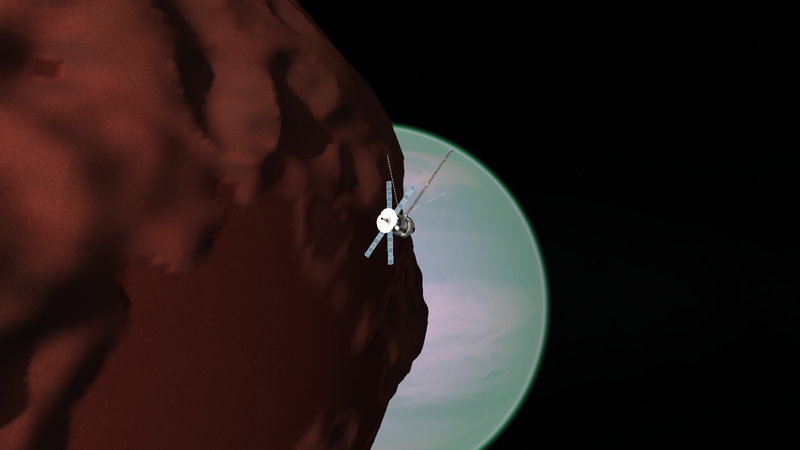 Beauty shot as the probe transfers from high Jool orbit to intersect with the Mun, from left Kerbin, Mun, Laythe and Jool. Telemetry from the Hokule‘a series II showed it successfully transferring to the Mun and then braking into orbit. 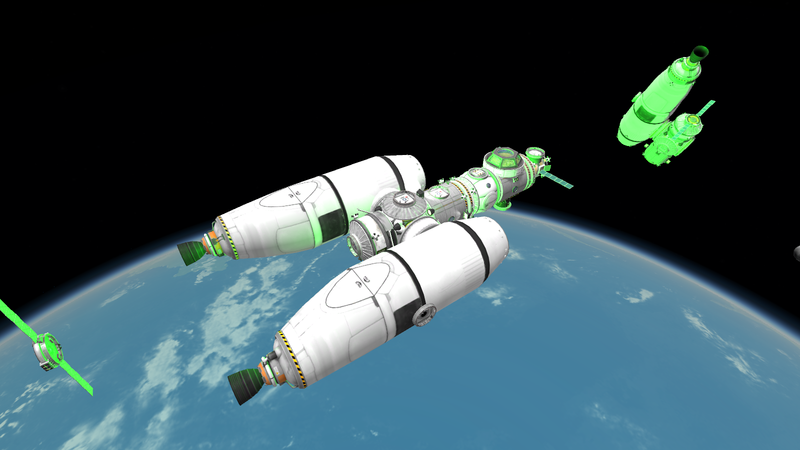 The Kerbals were then delighted to also see that they still had connection to transfer to a polar orbit. This satisfied the initial requirements for the contract. 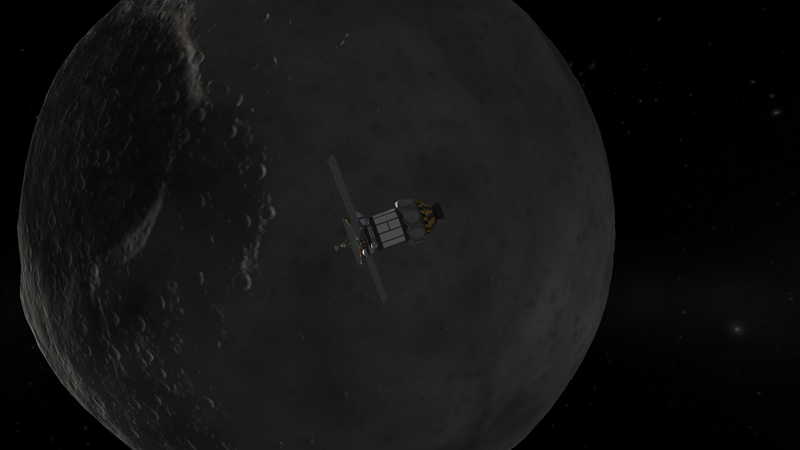 The probe was then set for it’s 60 day survey of Kerbin’s old friend. Hokule‘a series II in orbit of the Mun, heading towards periapsis. Now that the Kerbals have several probes in orbit of the Moons of Jool the pilots were getting bored. Next chapter out soon I hope.